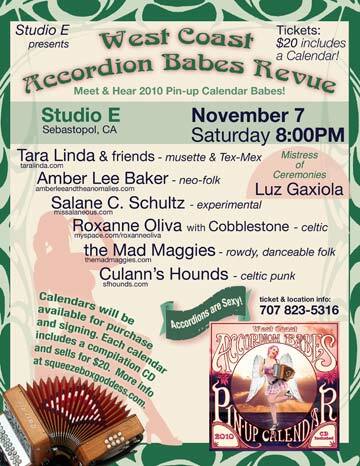 Admission is $20 and includes a 2010 Accordion Babes Calendar and CD — That’s a $20 value! So it’s like getting a free concert for the price of a calendar. Or it’s a free calendar with the price of admission — a good deal no matter how you think about it. The calendar makes a great gift! calendar’s accordion playing lovelies and their bands: Salane C. Schultz (experimental cabaret), Amber Lee Baker, (neo-folk), Tara Linda and friends (tex-mex/musette), Roxanne Oliva and Cobblestone (celtic), Mad Mags and the Mad Maggies (rowdy, danceable folk) and Renée de la Prade and Culann’s Hounds (celtic punk.) Lux Gaxiola of Circus Finelli is mistress of ceremonies. Studo E is special venue. Nestled in rural Sebastopol, this professional recording studio and sound stage has hosted many world-class artists in its comfortable, relaxed country atmosphere. It’s a cool, local secret you’ll want to check out. accordions, big fun, live music, Sebastopol.